Five illustrations depicting different ways that animal rights have been violated. During a quick research on google before starting drawing, I was shocked by how easy it was to find information on this subject and how reportedly common some of those practices are. At this point I wanted to focus on this aspect of the problem, the fact that it's happening every day under our noses, that these atrocities have become "normal". 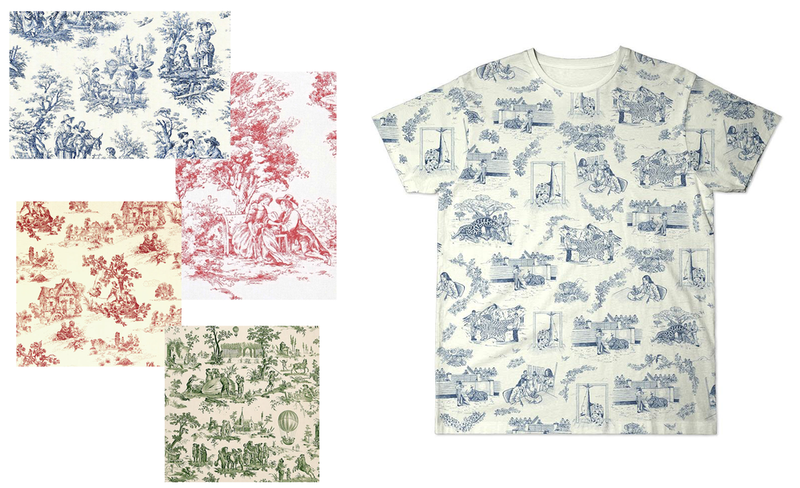 The "Toile de Jouy" is used in many ways (on coats, dresses, t-shirts, mugs, lamps, furniture...) but the one thing that never changes if the illustrations on the pattern. Generally of a rustic theme such as a couple having a picnic by a lake or an arrangement of flowers, also ordinary day to day life scenes, the normality of life. So that's why I decided to change all those "normal life scenes" to scenes showing dead animal, hunted, used in labs or just killed for "sports". Using the pattern subliminally delivers a message, we've all seen this print, and we never pay attention to what it shows, even if it's right under our nose.